It is some six years since the independent transport videos cameras visited the Sussex coastal resort of Brighton to record the bus scene. A good deal has changed making the contemporary bus scene just as enjoyable in 2017 as it was in 2011. In 2017 the bus services are still chiefly in the hands of the Brighton & Hove Bus and Coach Company which is part of the GoAhead group. We also see buses from Stagecoach, Compass Bus, The Big Lemon and Metrobus, as each company operate services into and out of the city. This programme covers two visits our cameras made to the city, the first in April and the second in July 2017. We begin filming at Old Steine where we see the spectacular lime green and mid-blue liveried, Wrightbus StreetDeck double-deckers operating the frequent route 12 group of services that run along the coast connecting Brighton with Eastbourne. 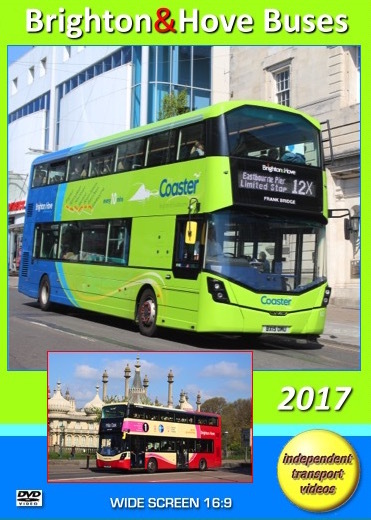 We continue filming around Old Steine and view most types of the contemporary Brighton & Hove fleet as well as the Enviro400 double-deckers of Stagecoach on the frequent 700 Coastliner service that links Brighton with Portsmouth to the west. Our cameras then move to Castle Square, North Street and the busy Churchill Square. Look out for the new low-height Wrightbus StreetDeck double-deckers on service 1 and the silver liveried Wrightbus StreetDeck demonstrator, numbered 293 (SN64 CTU). We also see the Volvo B9TL Wrightbus Gemini 2 double-deckers in the smart purple/maroon and buff livery that operate on the Regency route linking Tunbridge Wells with the city. Filming continues along Queens Road and York Place to the Railway Station to catch up with the action at this busy interchange. St George’s Place, Gloucester Place and Grand Parade are our next locations where we view the buses as they go about their business. Further filming along Pavilion Parade and Old Steine takes us to Marine Parade where we catch up with the action here. We see the Coasters running alongside the red and cream liveried buses in the Brighton & Hove fleet. Our April visit concludes with filming on Eastern Road and Edward Street as well as catching up with the evening rush at Old Steine, North Street and Churchill Square. Look out for the former GHA Coaches Volvo B7RLE, a Wrightbus Eclipse Urban, registered BA58 GHA now with Compass Bus. Our cameras return to the city on a hot day in July 2017. Again our locations are similar to the April visit taking in Old Steine, Castle Square, North Street, the Railway Station area and Churchill Square. Now it is time to sample the Coaster service! We board 940 (BX15 ONS) a Wrightbus StreetDeck with a H81F body for a ride along the coast to Seaford Library on service 12X. We pass a number of similar vehicles as they head towards Brighton. At Seaford we film the action on Sutton Park Road, Station Approach and Clinton Place. Our cameras then return to Brighton on board 925 (BX15 OMY) arriving at Marine Parade. Our final scenes are at Old Steine where we also see the solar powered Optare Solo of the Big Lemon company, YK55 ENM, together with buses from Stagecoach and of course Brighton & Hove buses. We hope you enjoy your visit.